Home » Cloud Server Security Tips & Tricks » Fully Managed or Unmanaged Cloud Server? 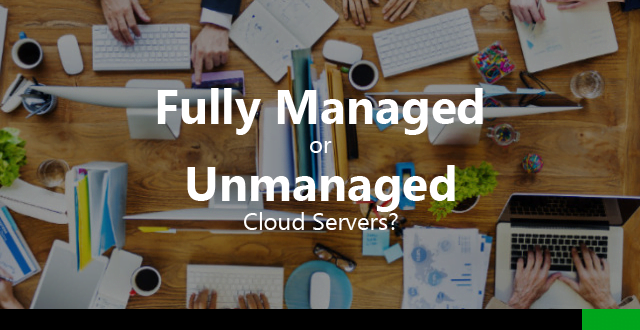 You may be familiar with the terms ‘Fully Managed‘ and ‘Unmanaged’ services when you are sourcing for cloud servers. For everything to make business sense, cost is of essence. Is Unmanaged cloud server the cheapest option? Let’s find out which is the best consideration for your business! The most evident and obvious thing to notice on unmanaged cloud servers are their price tags are always the cheapest. In unmanaged cloud server, all you are looking to purchase is a package of commoditised hardware and network from any datacenter location of your choice. If you break something within the server, you will have to fix it at your own effort, or you can pay your service provider to fix it, usually at an hourly rate. Service providers who sell Managed Cloud Servers usually bundle in certain management scope service that allows you to have peace mindset that if things go wrong, someone with the expertise can help you to fix it and restore your operation without breaking your wallet. Depending on how wide you want the management scope to be extended, it is best to discuss your requirement with your service provider, agree on the scope and voila, you have full control over the cost of running your cloud server, any issues you face should be fixed by your service provider at no extra charges at all. Fully Managed vs Unmanaged – Which one is cheaper? Are you competent enough to manage the cloud server all by yourself? While it does not require a rocket scientist to operate command-line UNIX, Linux or even Windows Powershell cloud servers, when it comes to managing production cloud servers, one must be fully aware of what he is doing as merely copy-pasting the command lines you find on Google is equivalent to rolling a dice for your issues to go away. If you are confident with your skills, Unmanaged cloud server can be considered, otherwise you are in better luck with Fully Managed service. How much is your time worth? Even if you know the inside-out of the entire operating system or the applications you intend to run on the cloud server, let’s be honest that your time is not free — for the same time spent in troubleshooting an issue with your cloud server, would you be more productive or effective to spend your time on higher value tasks? Fully Managed cloud server allows companies to outsource low value operation such as the routine system administration and ad-hoc trouble ratification tasks to service providers that can do it more cost-efficiently. How much will a downtime cost you? Yes, you could be highly competent as a system or infrastructure engineer and your time-effort spent on system administration is fully justifiable, how fast you can recover an issue-ridden system should tell you whether you are ready for Unmanaged Cloud Server. As a cloud service provider, the day-in day-out operation does expose these service providers to greater experience in handling mishaps in systems. By tapping into their experience, a fault can usually be rectified far faster than any in-house IT administrator that are caught off guard. In this regards, a Fully Managed Cloud Server saves you significantly through reducing the downtime of your operation. When a company evaluates the needs for Fully Managed or Unmanaged cloud server, total cost must be taken into consideration, which covers beyond just the price tag of the cloud server you are ordering. The unexpected/hidden costs are usually endless whenever an issue is discovered therefore consider the Fully Managed service a form of insurance to safeguard any companies against unexpected costs to restore a system back to its normal operating conditions. SecureAX provides fully managed cloud servers as well as unmanaged cloud servers in meeting most businesses’ application demands. Contact us for a free Cost Analysis to find out more on how we can help you! What needs to be backup and to where? Why should you consider Fully Managed cPanel Cloud Server?